We Are Losing the War! September 7, 1776: Turtle, a one-man submarine built by 34-year-old Yale graduate David Bushnell, unsuccessfully tries to attach a torpedo to the hull of the HMS Eagle anchored off New York Harbor. February 17, 1864: The Confederate submarine H. L. Hunley is the first to sink an enemy ship in combat when it rams its spar torpedo into the hull of the Union screw sloop USS Housatonic off Charleston, South Carolina. The Hunley was also lost after the action, the cause remains a mystery. April 11, 1900: John P. Holland sells his internal combustion, gasoline powered submarine, Holland VI, to the United States Navy for $160,000. September 5, 1914: U-21 sinks Royal Navy light cruiser Pathfinder – first combat victory of the modern submarine. September 22, 1914: U-9 sinks three British armored cruisers, Aboukir, Cressy, and Hogue. The Royal Navy employed 193 Q-Ships (armed decoys) to battle the U-boat. Their toll was 15 U-boats sunk with 41 lost during WWI. May 7, 1915: RMS Lusitania sunk off of Queenstown Ireland by U-20. Of the 1,195 lives lost, 128 were U.S. citizens. The ensuing controversy bought unrestricted submarine warfare to a temporary halt, but contributed to the rise of American sentiment for entering the war against Imperial German. Unrestricted submarine warfare resumed in February 1917. April 6, 1917: The United States declares war on Germany. 860,334 tons of Allied shipping sunk in April 1917 – greatest one-month losses of the war. May 1917: The convoy system is implemented, eventually reducing the losses markedly, but never eliminating them entirely. In October 1918, last full month of the war, losses were 116,237 tons. 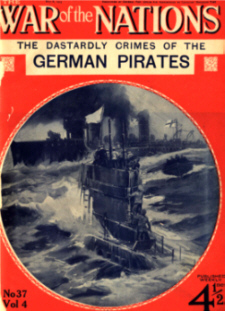 At the Armistice the German Navy had 134 boats in service with 229 more under construction. After failing to limit submarine warfare during negotiations for the Washington Naval Treaty of 1922, Great Britain, Japan, France, Italy and the United States signed the London Naval Treaty in 1930 thru which limited the construction of submarines to vessels less than 2032 metric tons as is was declared that international law applied to them as to surface vessels. Also merchant vessels which did not demonstrate “persistent refusal to stop” or “active resistance” could not be sunk without the ship’s crew and passengers being first delivered to a “place of safety”. Germany, which was not a signatory, ignored these points in World War II when the U-boat again proved a strategic threat against the Allies. July 20, 1960: First successful launch of a ballistic missile from a submarine by USS George Washington.